There was an unusual medevac from Carnival Paradise on Thursday. It seems a woman gave birth to a baby while the ship was en route from Ensenada to Long Beach, and the new mother, the newborn and the new grandmother were medevaced from the cruise ship by the Coast Guard when it was just south of the entrance to San Diego Harbor. The Coast Guard received the call at 10:40am (May 27, 2010), and they dispatched a 41-foot boat with a doctor to meet Carnival Paradise about 1pm as it passed San Diego. The three were taken to a local San Diego Hospital for treatment. Cdr Rochelle Nolte, the Coast Guard doctor aboard the Coast Guard vessel for the medevac, is shown in the photo above checking the infant's vital signs. Coast Guard video of the transfer is below. Carnival Paradise left Long Beach on May 24 on a 4-night cruise to Ensenada. It will return as scheduled on Friday, May 28. Whose Hurricane Forecast Is More Accurate? Two or three times each year before hurricane season, some "expert" group issues their prediction for the season, and no matter what it is, "highly active" or "quiet," the news media gets all excited and jumps all over it. These predictions are really of no value, other than giving the news media something to use to boost readership or viewership and try to whip them into a frenzy. We point this out at least once a year. We say these long range predictions have no value for three reasons. (1) They aren't accurate. Historically their records are dismal. (2) They don't predict where they will go. The area they cover is vast, covering the entire Caribbean, the Gulf of Mexico and the far western Atlantic ocean all the way up the eastern coast of the US and Canada. What happens one place has no affect on a location a couple hundred miles away, so saying there will be eight named storms this year is so generalized, it's meaningless. (3) It makes no difference how many storms there will be. You can't prepare any differently. You must be prepared each year to watch storms as they form, and then take appropriate action if the current one heads toward you. To our audience of cruisers, the numbers of predicted storms are even more meaningless. Cruise lines monitor the storms from the moment they form, and move their ships out of the way. They don't want their half-billion-dollar assets anywhere close to harms way. Now that may mean your cruise will not follow the exact itinerary as you planned (or it could even be completely changed), but it does almost guarantee that your vacation will happen - as opposed if you plan a land-based vacation that happens to be in the projected path of the storm. Occasionally, very occasionally, it does affect your port of embarkation (or disembarkation) on turnaround day, and that does create some turmoil, but generally, it means things operate a day late, and the cruise line assists in some way getting you there at the proper time. Finally, someone seems to be agreeing with us. Our friends at the National Center for Public Policy Research are taking National Oceanic and Atmospheric Administration to task for the lack of accuracy of their long-range forecasts of hurricane seasons, because they too have discovered they really aren't very accurate - especially considering the time and money spent on them because, according to the Center, we as humans just don't know enough about our atmosphere yet. So the National Center for Public Policy Research published the video below that will pit their expert's forecast (which was much less costly to produce) against NOAA's forecast. As the Center says in their press release, the intent of the video isn't to needle NOAA for their erroneous forecasts, but to make the point about how little we understand about our climate. NOAA does provide a vital service in tracking the storms once they form and then predicting their paths in the short term, and we wouldn't want to do without them there. The Center does make an interesting offer to NOAA however. "If, at the end of the hurricane season, Dr. Hansimian's forecast turns out to be more accurate than NOAA's, we challenge the agency to make him an honorary member of NOAA's hurricane specialists unit," said David Ridenour of the Center. "In return, if NOAA's forecast is more accurate, we'll include a prominently-displayed mea culpa on our website." They are still waiting to hear back from NOAA. Celebrity Cruises this morning confirmed that Celebrity Mercury will leave the Celebrity fleet at the end of February 2011. It will become the second ship in the TUI Cruises fleet, a line that is jointly owned by Celebrity parent Royal Caribbean Cruises Ltd and German travel conglomerate TUI. Celebrity Mercury had been scheduled to operate from Charleston (SC) beginning at the end of February. The line did not announce future plans for Charleston. 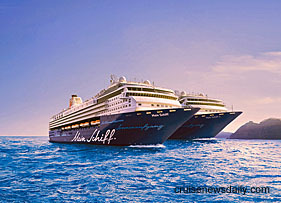 The ship will become TUI's Mein Schiff 2 and enter service for TUI in May 2011. Like TUI's other ship, it is expected to be marketed only in German-speaking markets. The artist's rendering above shows the former Celebrity Galaxy and former Celebrity Mercury sailing in their TUI livery as Mein Schiff and Mein Schiff 2. The complete article appeared in the May 27, 2010, edition of Cruise News Daily. The finishing touches are being added to Norwegian Epic at the STX Europe yard in Saint Nazaire (France) in anticipation of the handover to Norwegian Cruise Line later this month. The video below shows some of the interior detail work being completed. Cruise lines have high standards aboard their ships, so things get replaced often - some things more often than others. So cruise lines routinely give away slightly worn things from their ships - a couple hundred mattresses to a homeless shelter, a hundred televisions to a charity who will distribute them to low income families. Holland America even came up with an innovative program for giving partially used toiletries left behind by passengers to homeless shelters, filling one of their greatest ongoing needs. To the recipients, these are like gold. routine. It doesn't get replaced that often, and is quite a "sizable" and even "used" is quite valuable. And it's very welcomed by the schools which receive them. This month, Holland America has given away three grand pianos to South Florida schools, and that brings to ten the number of pianos HAL has given to schools since the first of this year. Details appeared in an article in the May 25, 2010, edition of Cruise News Daily. CND subscribers also read about violence in Jamaica having no effect on cruise calls in Jamaica ... a major drug bust aboard MSC Opera when arrived at Dover last week ... and a big day in Anchorage when Holland America's Amsterdam arrived at the city's pier. It was the first time in 25 years a large cruise ship had docked there; most now go to Seward or Whittier. Details appeared in the "Other Things You'll Want to Know" column in the May 25, 2010 edition of Cruise news Daily. Updated at 8pm EDT - A 45-year old man who was a crew member aboard Royal Caribbean's Oasis of the Seas went overboard from the ship on Sunday afternoon. Oasis left Port Everglades on Saturday, and the man was reported missing by his coworkers about 1pm on Monday as the ship traveled between Nassau and St. Thomas where it was scheduled to call on Tuesday. A search of the ship was initiated, and while it was still being conducted, the ship was turned around to begin retracing its route since he was last seen. The US and Bahamian Coast Guards were notified and joined the search. In reviewing recordings from the ship's security cameras, images were found that confirmed the man had actually gone overboard shortly after leaving Nassau on Sunday. Oasis was released from the search very early Tuesday morning and is continuing to it next port of call. The man has not been found, but the Coast Guards are continuing their search of the area. As a result of the search, Oasis will miss its call at St. Thomas but is expected to be back on its schedule in time for its call at St. Maarten on Wednesday. The complete story appeared in the May 25, 2010, edition of Cruise News Daily. + and there was a conviction in a British court in the case of two men who tried to smuggle 72 pounds of cocaine aboard Fred Olsen's Black Watch in March. Details of these stories appeared in the "Other Things You'll Want to Know" column in the May 24, 2010 edition of Cruise News Daily. Updated 7:30pm EDT - An engine room fire today forced the evacuation of Deilmann Cruises' MS Deutschland in the Norwegian port of Eidfjord. The 22,500-ton ship was docked at the time of the fire, and local reports say that all 364 passengers and 241 crew members were evacuated safely with no serious injuries. All but 30 of the passengers were reported to be from Germany, with no North Americans aboard. The fire was first reported at about noon local time (6am Eastern Daylight Time), and everyone was accounted for on land about four hours later. A spokesman said that the fire was contained to the engine room, but crews were having to cool the hull before the fire could be controlled and extinguished. Norwegian officials report the fire was extinguished late Sunday afternoon. A Deilmann spokesperson said that hotels had been arranged for the passengers for Sunday night, and they would be flown home on Monday. The ship will be towed to Bergen on Monday for damage assessment. Deilmann has canceled all sailings to June 7. The complete article appeared in the May 24, 2010 edition of Cruise News Daily.